My Mom meticulously scans every credit card, cable or cell phone bill to ensure that no errors have been made or hidden fees have been issued. I, on the other hand, don’t have the time or the patience to do this. And I’m sure along the line, I’ve been overcharged or scammed in some way. BillGuard, a startup launching to the public today at TechCrunch Disrupt, aims to alert users of unwanted charges such as hidden fees, billing errors, scams and fraud on credit card bills. The essentially crowdsources scams by alerting you when a charge on your bill is flagged by anyone else using BillGuard or posting scams on online forums. The startup will also take into account its own analysis (which the company has been working on for the past year) and monitor the web for any complaints about credit card scams. Here’s how it works. 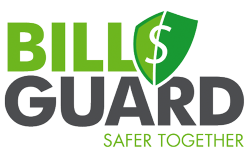 You sign up your credit card accounts on BillGuard. The startup’s proprietary algorithm then aggregates, mines, normalizes data from its own reports and from its crowdsourcing engine. BillGuard will then scan your card activity daily, and email you when your attention is required for a suspicious transaction on your monthly bill. While many credit card companies have fraud protection services, it’s up to the consumer to be vigilant about any billing errors or hidden fees on credit card bills. Plus, I can’t remember how many times I’ve signed up for a ‘free service’ only to be be charged when the terms of the service expired (and I’ve conveniently forgotten to cancel my subscription). The same way in which an identity theft service monitors your credit report for fraud, BillGuard tracks your credit card bills so you don’t have to. The site is already in discussions with a number of major banks and identity theft companies to distribute and recommend BillGuard’s service. And the site has caught the attention of a number of well known investors, including Bessemer Venture Partners, Chris Dixon, Ron Conway, IA Ventures, Howard Lindzon and Yaron Galai; raising $3 million in funding. Q: I thought that was awesome. No questions. A: I Agree, a home run. Q: We send you a monthly scan report, whenever we have alerts, we email you. Q: I think you’ll have a huge interest in this from the general population because you are going against the bad guys. Q: What did you to before this. A: I built Pando, we have a team of security experts, data scientists, mathematicians. Q: How far back do you go?